The most obvious sign that they are two different versions is the timing of the ships as seen by their different positions. In the version shown at the top, an additional optical oddly appears on the fourth frame - wisps of clouds. These bootleg sources with the "cloudy composite" and more rarely seen credit roll are Dolby Stereo prints, no bootleg with mono mix and these variations have appeared as of yet. 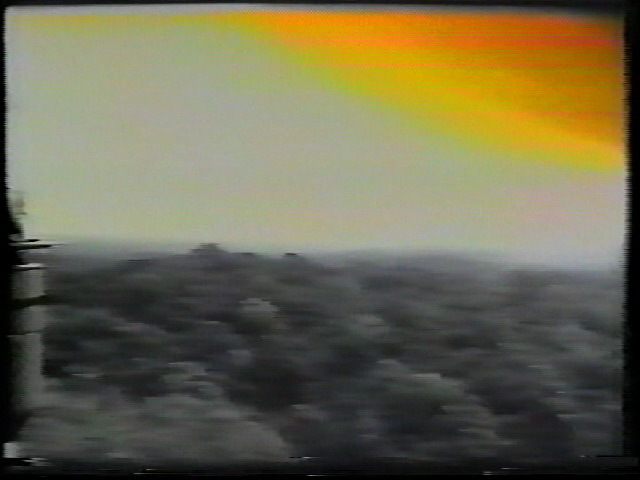 Why this "cloudy composite" reappeared on the early home video releases is a question mark but with more than one Interpositive around and with such a subtle variation it probably just went through by mistake. French "Pyramid" LD ('94 pressing) '89 source? The most logical conclusion based on the sources that's been examined so far, is that it's a difference that can be traced to the initial batch of prints vs. later batch of prints shipped out in June '77, (sort of what happened with 70mm vs. 35mm versions of ESB, where several tweaks was made to the film a few weeks after its premiere) the expanded release began June 15 and that is also the time when prints with the Mono mix started to appear. But everything is possible of course and we cannot nail it down yet, hence this thread. Will continue to update the list when we find out more from other versions and if more subtle tweaks are discovered. Another subtle print variation but this time in reel 5. As I suspected, the credit roll and X-Wing matte shot were not the only things revised. The extremely subtle difference is in the matte shot of the rebel base - while the live-action footage utilized for the shot is exactly the same, the timing of it is slightly different, causing us to see five frames less of it from the beginning and five more frames of it at the end in the Special Collection print. See the different position of the rebel trooper in the middle of the frame. Another print variation can be seen in reel 3 - in the shot where the Stardestroyer is chasing the Falcon before it goes into lightspeed. Special Collection LD at the top and the 2006 Bonus Feature DVD (GOUT) at the bottom. In the Special Collection print there are several of these crude marks which appears to be intended for laser impacts, they are absent in the GOUT print. You could almost mistake them for dirt. The left laserbolt are drawn all the way to the end of the screen in the Special Collection print, in the GOUT it disappears behind the ship. As you can see there is a clearly defined matteline where the laserbolt meets the Destroyer in the GOUT print. The laser fire throughout the sequence have been changed so that it appears to come from above or straight from the front of the ship instead. Or more accurately described, the Destroyer was layered on top of the laserbolts instead of vice versa. The timing and intensity of the flash frames differs, the flash frames are quite muted in the Special Collection print where the ship is still visible whereas in the GOUT print there's a solid white one in all cases except one. I've only checked Moth3r's 35mm bootleg so far but I'm pretty sure the same pattern follows as for the previous differences. Discussion started on this page: http://originaltrilogy.com/forum/topic.cfm/Complete-Comparison-of-Special-Edition-Visual-Changes/topic/11927/page/45/ decided to move it to this thread, so we don't fill that thread with these '77 print variations. Since the ITV version looks to be an in-house transfer, the film print they received was most likely Academy flat (i.e., the film was unsqueezed and cropped using an optical printer, so the print itself was P&S), but who knows what element it might have been derived from? If only someone could track down one of those flat 16mm prints that used to appear on eBay, that might answer some of the questions. If it was a cropped print, the presence of the mono mix isn't really an enigma, Fox or Lucasfilm or whoever likely just combined the mono soundtrack with the cropped picture element. One key difference is that, though I believe it has the Episode IV crawl, it has the 1977 flyover, meaning the edit point is right after the crawl instead of at the end of the flyover as it usually is. All good points, will need to check with Russ if he can provide more examples from that ITV recording. I keep forgetting it didn't have the Tantive corridor marks. It's also a damn weird place to splice in the '81 crawl, maybe there was damage involved. It has the clouds. Not surprising, it shares a lot of printed-in damage and splices with the Puggo Grande print, so both 16mm prints must have been made off the same internegative. Well, that's just great. Due to the generation loss and the digital macroblocking (not really visible in this frame), I can't TELL whether or not the clouds are there! My instincts say they aren't, but it's so degraded that the planet just looks like a big blob of color. Does anybody at least have a copy of this bootleg without the macroblocking, or is this it? Yes, the Catnap had already been checked, I posted my find some time ago in the other thread. Mallwalker sent me a clip from the Starkiller boot some time ago, even with his IVTC on it, it was impossible to tell for sure but just like you, my instincts tells me it's the cloudless. Another that cannot be determined is Puggo's Swedish 16mm, blown out highlights. I'm confused by that statement, since there's two on usenet. One is called MeBeJedi, the other called the Starkiller. Which is that you're showing ? Depending upon your answer to my previous question, try the other one? Try the one which doesn't have bitrate allocated for LPCM soundtrack? A tape made it's way through the yahoo SW Cutscenes mailing list. Think Treadwell got it first and duped it to T-Bone who I think MeBeJedi told me that's where his copy came from. Can't recall if I sources Starkiller to that same group. I didn't realize they were two different preservations - I've heard people refer to "Starkiller/MeBeJedi", but that may just have been blanket references to that cropped, mono mix bootleg transfer. Mine must have been MeBeJedi, since it had the blocking. I purposely picked a frame that had as little of it as possible. And BTW, the color looks different because I adjusted the hue, which is way off on the raw version, and turned down the saturation to try to counteract the chroma decay and make the remaining luma detail a little easier to see. OK, I grabbed a new screenshot from the TWC326 version of the cropped, mono mix bootleg. I used VLC to correct the hue, decreas the saturation a little, and very slightly sharpen it. Not much better. The planet still looks like a blob of color. Still, my hunch is that this is the cloudless composite. Also, the guy with the cat-face emoticon showed me the version of the scene that appears on the French pre-THX "pyramid" laserdisc box set. As you can see, it's cloudless. LDDB says this release is from 1994, and the packaging resembles the U.S. Definitive Collection, but the LDDB pages for the single-film 1994 discs say they're improved pressings of the same masters as the earlier French letterbox discs. So that would mean this transfer dates back to 1989. EDIT: Andrea also told me that the French Pyramid LD doesn't have the Tantive burn marks. So apparently, this film source had no burn marks AND no clouds, as well as having the Greedo subtitles (since they had to switch to a different, vastly inferior print for the clean Greedo scene - go figure, the JSC already had it clean and it didn't look like a dark, purple-tinted mess). Interesting, even if I live in the PAL-region I'm not familiar with what the sources was that they used for PAL video releases over the years. This French LD would be nice to get preserved even if the transfer/master itself was subpar, must be the only widescreen transfer of SW that hasn't been preserved around here yet. Wasn't there someone on this forum who owned the German pre-THX LD? Andrea also told me that the French Pyramid LD doesn't have the Tantive burn marks. So apparently, this film source had no burn marks AND no clouds, as well as having the Greedo subtitles (since they had to switch to a different, vastly inferior print for the clean Greedo scene - go figure, the JSC already had it clean and it didn't look like a dark, purple-tinted mess). I got my copy from cutscenes pioneer Ryan Silva. and I'm sure that we all have much better, legal copies lying around. Nevertheless, as an account of the minor changes made to "Star Wars"
over the years, it's priceless. but the lines were formatted differently. Can there be any truth to that statement? and is the bootleg discussed there the same source as Starkiller / MeBeJedi / TWC326 ? I'm 99.999999999999% sure that's the same bootleg used for Starkiller/MBJ/TWC326. Mono mix? Check. Virtually static cropping? Check. Horrible quality from who knows how many generations of copying? Check. As for that last part, there is no version of the film which reverses those two scenes. I'm watching TWC326 right now, "Come on R2" comes first just like in every other version ever. I don't think he's talking about that specific bootleg. I think it's a faulty memory along the lines of "Early prints didn't have the mouse droid scene" or "Early prints had Luke missing with the grappling hook" or "Early prints had the Biggs scenes." Back in the Usenet-and-VHS-trading days of 1995, still relatively few people had seen that bootleg, and no other versions had yet surfaced in the fan community, so there was still rampant speculation and hearsay. With all the sources we've accumulated in 2012, any claims of missing scenes, additional scenes or different ordering of scenes have been disproven. If there's anything we haven't yet discovered, it's going to be something like the X-wing takeoff, a subtle variation in the versions we already have. So in short, no, there is absolutely no truth to that statement. Myth busted, case closed. if it's a reversed scene. I know this may sound crazy, but considering all of the glue marks on the JSC (at the end of almost every shot (not scene) change) and the differences in certain shots in our oldest known sources, is it possible that early generations of the film were kept as many separate pieces and reassembled to strike new masters? Why the '82 IP whatever it is, was given such a quick and dirty glue job is anyone's guess. One things for sure, it doesn't represent what's seen on the theatrical prints in terms of splice glue. We have this statement, taken from Kaminski's article http://secrethistoryofstarwars.com/savingstarwars.html (believe the source is American Cinematographer); "Star Wars was a popular film, and over the years so many theatrical prints were made that the IPs/INs got worn out, and new ones had to be made. The last one made was in 1985, intended to be a master copy for home video releases." I guess they simply meant the last one was made in 1982. In '92 for the widescreen video releases they suddenly decided to dig up a worn out early generation IP (Technidisc / Definitive Collection / Faces). I don't get why the IP's were so worn out, isn't it mostly the IN's that gets worn out for making new prints? IP's are rarely touched the way I understand it. Yeah, it's another weird statement I never got. You don't make a positive from a positive. Or at least you're not supposed to. Maybe there was an underground cottage industry at Fox, making straight dupe bootlegs. 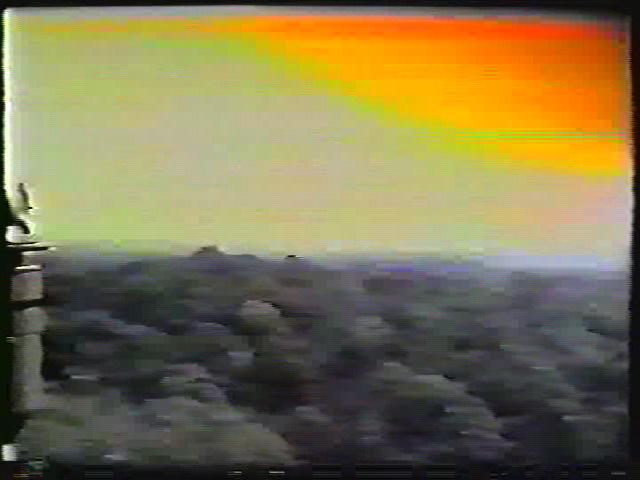 Another interesting discovery is that the source used for the UK '91 or '92 SWE tapes appears not to be that glue party of a 80's home video master. In reel three in the 80's home video master, there is some dirty frames that appears to be caused by some kind of liquid. "...but I've never seen anything to make me believe there's one all-powerful source..."
Not in the 80's ITV-broadcast print either. Maybe it was cleaned up for that UK video release but I doubt it. Very very interesting. I had also assumed it was sourced from the JSC/SWE transfer, since it seemed to be converted from NTSC. Back in 2005, Russ Dawson and another user both noted that the '91 releases ran longer than the other PAL versions, and the '91 LBX release of Empire definitely looks to be a straight copy of the JSC/SWE transfer. If they were new transfers for PAL, why wouldn't they be 4% faster like the other releases? 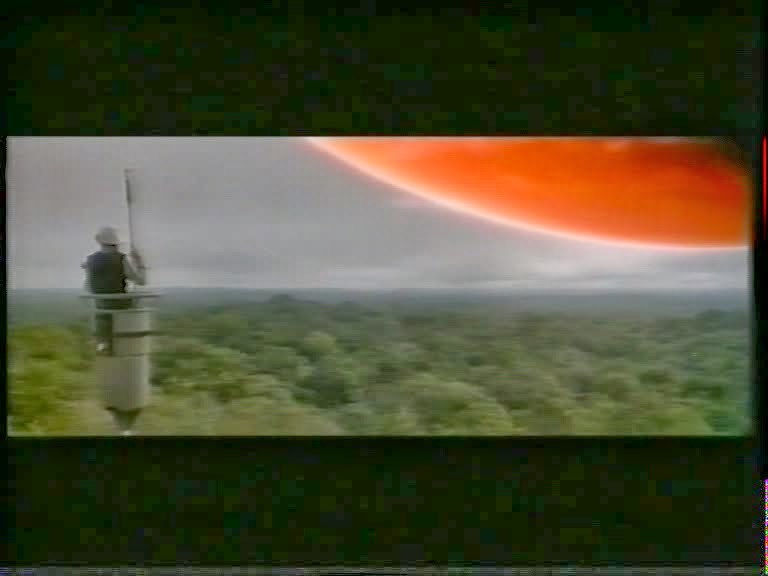 I'm also noticing that the bottom of the pylon is cut off compared to the JSC, and the widescreen image has an AR of about 2.55:1. That suggests that this '91 UK widescreen release was sourced from the SWE "shrinking ratio" version. That doesn't make sense with what you just said - didn't the "shrinking ratio" SWE still have the glue? One of Mallwalker's JSC/SWE comparisons clearly showed splice glue in both versions. I thought the SWE was just the JSC version modified to remove the Japanese hardsubs - wasn't that the cause of the "shrinking ratio" in the first place? Can someone check the "shrinking ratio" version and see if it also has the blobs on reel 3? Also, it'd be nice to see a screenshot of the X-wing takeoff scene, to compare the framing to the '91 UK widescreen VHS. Very very interesting. I had also assumed it was sourced from the same transfer, since it seemed to be converted from NTSC. Back in 2005, Russ Dawson and another user both noted that the '91 releases ran longer than the other PAL versions, and the '91 LBX release of Empire definitely looks to be a straight copy of the JSC/SWE transfer. Does this also mean that the '91 doesn't have the shrinking ratio problem? And if it's a different transfer from a different print, why wouldn't it be a made-for-PAL transfer with 4% speedup? Are we 100% sure that the "shrinking ratio" version also had the glued splices and weird blobs? No, the Technidisc version was specifically made to correct the shrinking ratio issue. It's a different transfer of a different film element (the same one transferred for the Definitive Collection/GOUT). Oh, I thought it was a different (corrected) transfer of the same film element as the other Special Widescreen Edition. So it uses the same master as the DC, but without the DVNR? Same film element as the DC, different video transfer. The color balance is different, the framing is different, etc. Good eye, the '91 UK SWE VHS seems to match the "shrinking ratio" SWE LD. And yes, the "shrinking ratio" LD is the same source as the JSC, glue marks and damage is all present on that one as well. So I thought Russ maybe gave me wrong information and maybe checked his '94 tape instead when I read your post, but he had given me yet another PM where he clearly says that the liquid damage isn't visible on his '91 tape... weird. He said he is going to post screenshots from it. What exactly is the '94 UK Digitally Remastered tape, I assumed this was the PAL regions first THX mastered release but no such info on the case, it says new PAL masters were used on the back of the covers. What's the story, did this transfer go through any DVNR? And is there any differences between the individual '95 tape and the one in the Executor box set? Russ and I have been corresponding about the 1991 PAL widescreen VHS, and I've viewed some video clips of it. It does seem to be transferred to PAL from NTSC, and it has the exact same "shrinking ratio" problem as the U.S. SWE LD - and I mean "exact", I can see the black bars get bigger at the reel changes, and the before/after difference seems *identical*. HOWEVER...it doesn't have the weird blobs or the splice glue marks from the JSC/SWE! Same shrunken ratio, no glue marks. What is going on here? Is it a different film source that happens to have the same variations as the JSC/SWE one (no Tantive burn marks, cloudy X-wing takeoff composite), but none of the weird blobs or glue marks? Is it the same source but with something like Filmguard applied? If it was a new transfer, why was it sourced from NTSC instead of being native PAL? If was an existing transfer, why was it never used on any NTSC release? In either case, why does it have the shrinking ratio problem? I thought that was due to a problem covering up the JSC's Japanese subtitles and repositioning the up-shifted image to the center. If this is a different master, it means that the same framing mistake was repeated. Why do two different video masters have the same issue, and why do the film sources look identical except for the presence or lack of certain damage?